This model was made in about 1981. I think you have to be drunk or stoned to get much pleasure out of these and as I don't do either, they are only brought out on special occasions. It is interesting watching them circulate though a disco from person to person. I haven't lost them yet. They use a 555 timer driving a 4017 CMOS decade LED driver with each leg driving 4 standard low intensity LED's (?20 mcd) with each side rotating in opposite directions and cycling through different colours. There is a speed control to go from standstill to continuously on. It takes a lot of interconnections around the frames. If I was to remake them I would use a smaller rechargeable battery and high intensity LEDs. The coloured rings are, of course, the appropriate fashion accessory for the glasses. High power white LED 2004. This LED (Luxeon Star) is 180,000 mcd and draws 1 watt (350mA at 3.4 V) and was claimed to be the worlds brightest series of LED's in 2003. 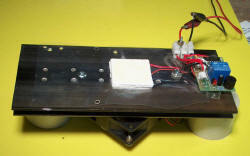 Since then 5 W LEDs are available. It has a heat sink and a separate collimator for a 10 degree beam. It cost AUD$36 on eBay. Shown below after I mounted it on some acrylic with a voltage regulator in the handle. The brightness comparison with a pencil torch is dramatic and is over 10 times brighter than the LED's above. It comes with its specifications on a floppy disk. A whatchyamacallit 1980's Not sure what to call this thing made about 20 years ago. It used some sort of transistor oscillator (now covered in tape) driving an E core iron electromagnet at >20 kHz. 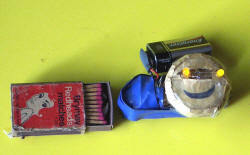 It runs from a small 9 V battery and has a reed switch in it to turn on. You bring the box of matches with a hidden magnet just visible here close to turn it on. It induces a current in the coil of unknown turns to drive two LED's on a smiley face. The LED's still light up about an inch away. It still works but I have replaced the LED's after the leads broke and replaced some of the tape. So, remote signalling and remote power transfer 1980 style! 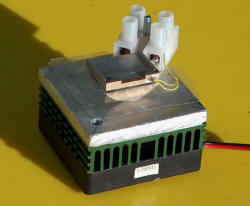 Peltier effect device (thermo-electric cooler) These are semiconductor heat pumps that use electrical energy to cool one side and heat the other. This 100W device runs on 15V 6A or so and are meant to cool Pentium like processors. It requires a good heat sink to get rid of the heat and preferably fan cooled. There is an optional controller to fix the temperature between 30 - 40 C.
On the left picture, ice is forming on the top plate while the fan-cooled heatsink is getting hot as it has to handle the 100 W input plus about 50W of heat pumped away from the top plate. The right picture shows a smaller Peltier device from inside a laser component which I have mounted on a small heatsink and fan. This is a device I made in 1990 for use by elderly forgetful patients who may not remember medication times. In essence it is preloaded with one weeks medications. The internal timers then rotate the platter such that the medications are visible to be taken. A light flashes and buzzer sounds until the medications are removed (triggering an infrared beam). It has an internal rechargeable battery which can last a week if unplugged. There are safety interlocks. The most complicated part was designing a programmable timer for up to 4 medications times from scratch using discrete parts. A combination of two kit projects crammed in a small case made in the 1980's. This was fan cooled and rated at 100 W/channel into 8 ohms. It was used in my Honda Civic for many years running from a 300 W 12 V / 240 V inverter. It powered a set of efficient large Cerwin Vega speakers with 12 inch woofers which took up all the space behind the front seats.